Go to any decent hotel, and you'll find curved shower rods. They have worked their way from mainstay hotel applications to a great inexpensive home repair upgrade you can add to your home or apartment. Showering in a tub has always been a confining experience, but now with the use of curved shower rods, you can gain a spacious feeling and not have the curtain liner attack you anymore. 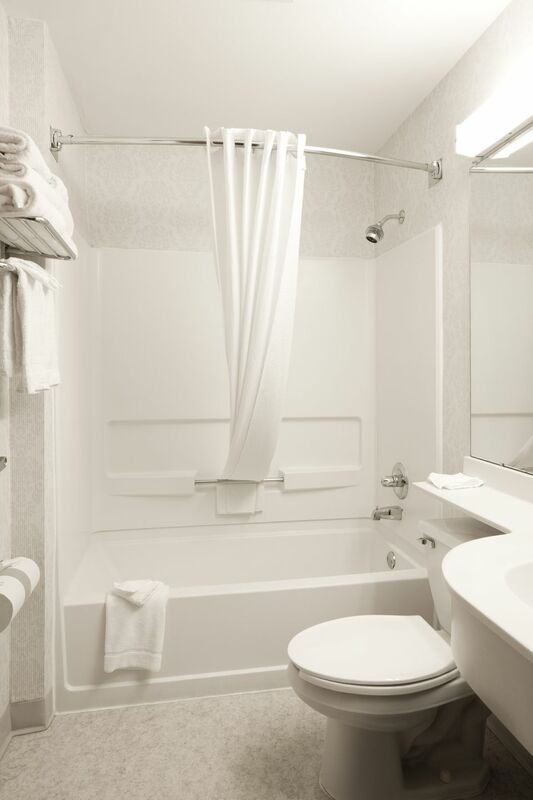 Curved or crescent-shaped shower rods come in either adjustable or fixed length models. Their installation is the same, except that with a fixed length rod you have to get the rod ordered or cut to your specific needs. For this tutorial, we'll assume you're using an adjustable shower rod since they are more common for home use, easier to install and less expensive. Installing a curved shower rod is easy if you follow this tutorial. You do not have to drill new holes back from your original shower rod. By doing that you complicate the installation and reduce the benefit of the curved shower rod. Moving the curved rod back 3 inches toward you will crowd you more than before. Also, by moving the rod back as some would suggest, you end up with old holes that now need to be patched, filled and painted. Both are bad results we want you to avoid. Here are some tips to make the install easy. Remove old shower rod and brackets: using a screwdriver, remove the 4 screws holding the old shower rod in place. Locate new mounting holes: using the bracket of your new curved shower rod as a template, hold the bracket up to the wall with the top hole of the bracket over the top or outer-most old mounting hole. Making sure it is level, mark the location of the bottom hole of the bracket on the wall. Install plastic wall anchors: install plastic wall anchors for each of the new bottom holes. Remove and replace any old, mangled plastic wall anchors from the old top holes with new plastic anchors if necessary. If your old shower curtain mounting bracket was installed with the holes oriented horizontally instead of vertically, you need to use the screw hole furthest from the tub as the top hole of the new bracket. If the new bracket does not cover the other old hole, then it will need to be patched, and the wall touched up with paint. Install Mounting Brackets: Once the plastic wall anchors are in place, fasten the new curved shower rod brackets to the wall using the new screws provided with your shower rod kit. Install curved shower rod: Clip one end of the curved shower rod into the bracket as instructed by the manufacturer's instructions. This may vary by manufacturer but will generally use a spring-loaded clip of some sort to spring into holes or will use screwed fasteners to attach the rod to the bracket. Extend the adjustable curved shower rod as needed until it is the correct length, then install the second end of the rod to the wall bracket on the other wall. 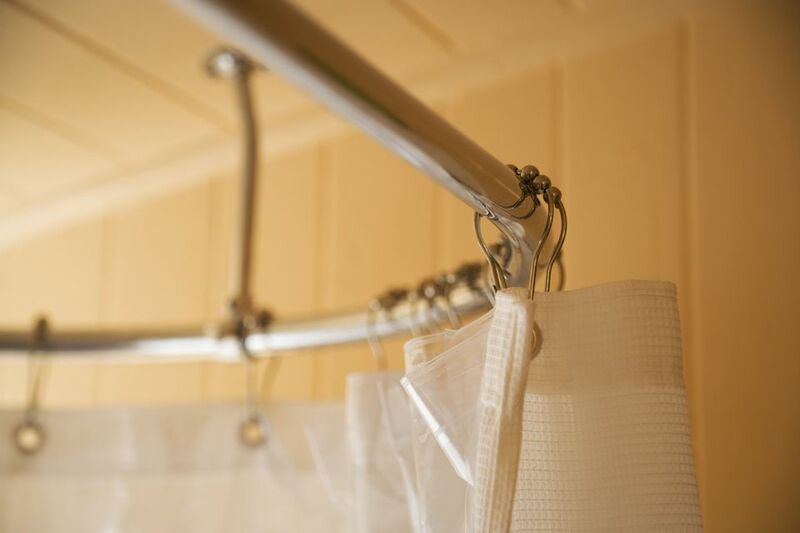 Install shower curtain and liner: Next, install your shower curtain and liner, and you are all set!